When most people think of townhomes they think small spaces, but this is not always the case. 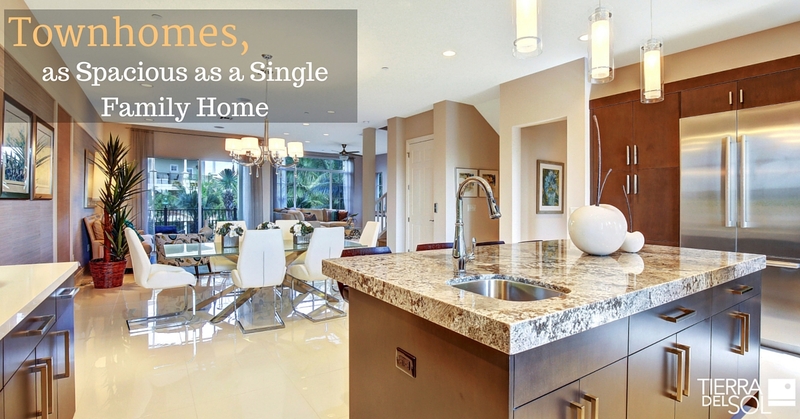 Many townhomes are designed for people who want spacious rooms, open kitchens and high ceilings. Tierra Del Sol townhomes located in the coastal town of Jupiter are 3400 square feet and more. These townhomes were designed for the homebuyer looking for a home with attention to detail, large rooms and many more features. Vaulted Ceilings – when it comes to spacious townhomes vaulted ceilings are a determining factor. This extra space adds square footage to your home and gives every room a spacious feeling. Another benefit of vaulted ceilings is increased light. The windows tend to be larger and you can add more. Master Suite and Bath – many townhomes like Tierra Del Sol have a large master suite and bathroom. Having a master suite with a large closet is luxurious and adds comfort to living. In a large master suite you can add a chaise lounge or couch for reading, seating for you and friends and or your spouse. A large bathroom adds comfort and convenience to your home. You will have the space for a roman tub, separate shower and cabinet space. Open Kitchen – another benefit to a large townhome is the open kitchen. Most homes are being built today with a gourmet, open kitchen. An open kitchen creates a spacious feel and look. This is perfect for entertaining. Two Car Garage – many people think of a one car garage when they think of townhomes, but larger townhomes have the space for two or more cars. This is a huge benefit especially in South Florida where we have storms from time to time. You shouldn’t assume that a townhouse will not have the space you desire. Many townhomes are built with luxury and space in mind like Tierra Del Sol.